An unequalled display of extreme musicianship from one of the premier drummers in modern metal. Ever felt like having one of the worlds best metal drummers a mouse click away, at your beck and call, 24/7? 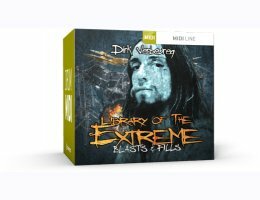 Enter Dirk Verbeuren (Soilwork, Scarve, Aborted) and the Library of the Extreme – Blasts & Fills; a collection of more than 1,000 individually played MIDI files, executed with such a razor-blade perfection and ingenious brutality that it will hit you like a 20 ton wrecking ball of sheer metal. This library is undoubtedly your one-stop shop when looking to have world-class, impossible-to-program blast beats and fills only seconds away! Works with EZdrummer, EZdrummer 2, Superior Drummer 2 (optimized for 1 or 2 kicks, 1 snare, 2 toms, 1 floor tom, 2 crash cymbals, 1 china and 1 ride cymbal).